Arches gives the room elegance, looks modern and stylish - they are classified, depending on the shape, the manufacture of the material, style. 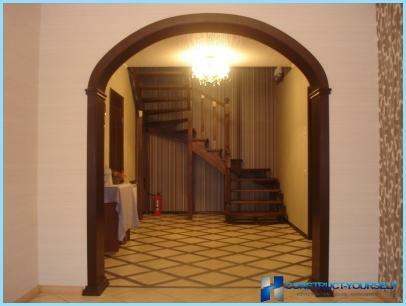 MDF: arches can be manufactured for sale in the form of a synthetic film, veneer, tinted or uncoated. Natural brick or stone - an expensive option. These arches create pressure on the construction of the house - characterized by significant weight. Classic style involves the use of radial arches correct form. Modern - arches are elliptical. 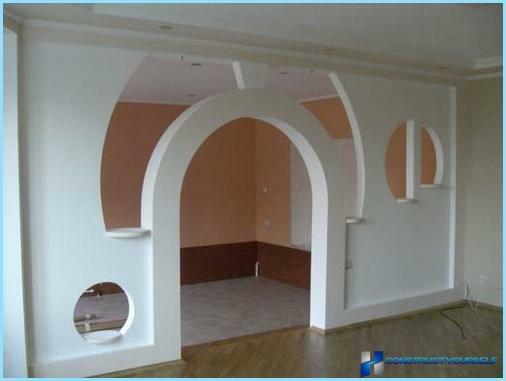 Hi-tech - using asymmetrical arches: one side can be rounded, the other - a rectangular or wavy. Gothic style - recommended strict, sharp-angled, rectangular forms. 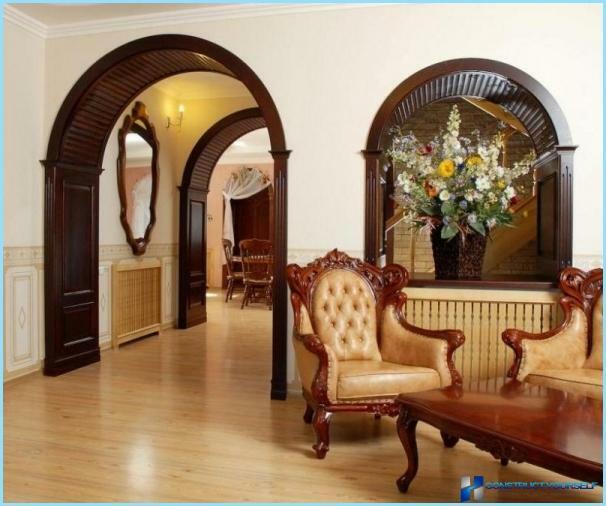 Romantic, Baroque - arches may have a circular or rectangular shape. Roman arch is considered a classic, semicircularform. Different brevity, simplicity, devoid of additional decor. It will look great in a room with high ceilings. It stresses the elegance of the interior - it can be made of plasterboard with their hands, or choose a ready option of wood or MDF. British style or modern different truncatedradius slightly elongated design. Not permissible angles - a bend in the arch should be smoother. 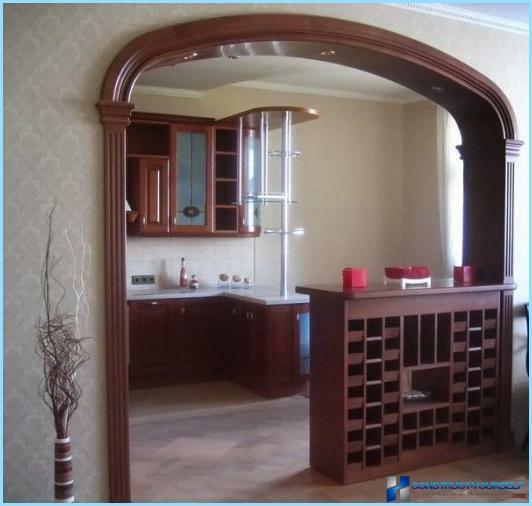 It can be made in various colors - decorated with both apartments and houses with low ceilings. Portal - a rectangular arch. The main function of the portal - an elegant selection of the doorway. Depending on the design solutions can be combined with shelves, stools. Slavic - rectangular shape, but the corners are rounded. It looks restrained, suitable for the Scandinavian, minimalist, urban styles. Characterized by a small radius. Thai arch in the doorway: it is characterized by asymmetrical - one side can be rounded, the other - remains rectangular. The dimensions do not matter. 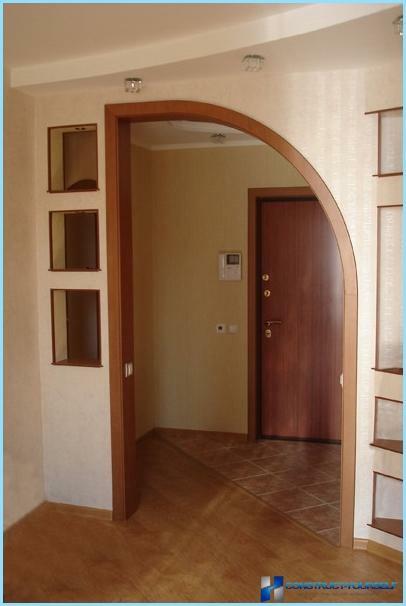 Trapezoid Arch: made of wood, MDF or plasterboard. It fits in any room with a ceiling height. The width of the opening does not matter. 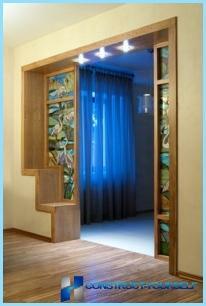 Arch-transom decorate the interior in modern style, Gothic, Empire - a decorative element is a stained glass or mosaic. Rounded or rectangular. 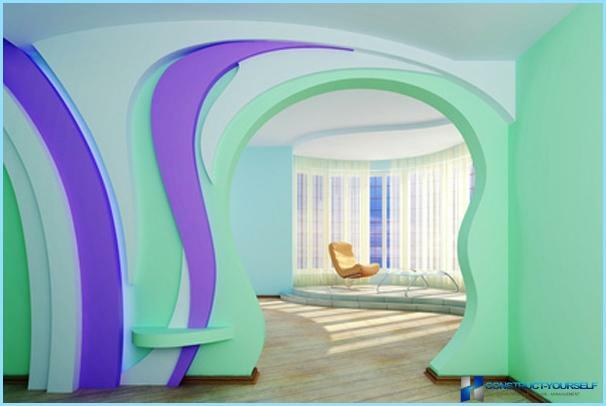 Arch-ellipse - an unusual option for rooms in a contemporary style. May have a different radius. Perfect for the selection of functional zones. 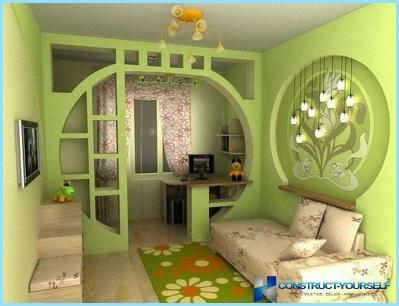 Interior arches are used to create the effect of a solid space - this is actually a trend of modern interior design. note! 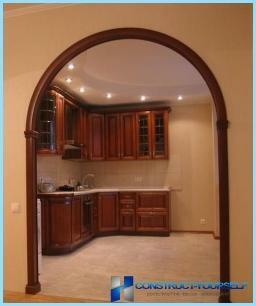 Arches used in small apartments: they visually make the room more spacious, freer. The material allows you to realize any, even complex and asymmetric, shape. With the drywall can handle a person who has no knowledge of the narrow construction - material is easy to process. Drywall does not create an additional burden on home construction. 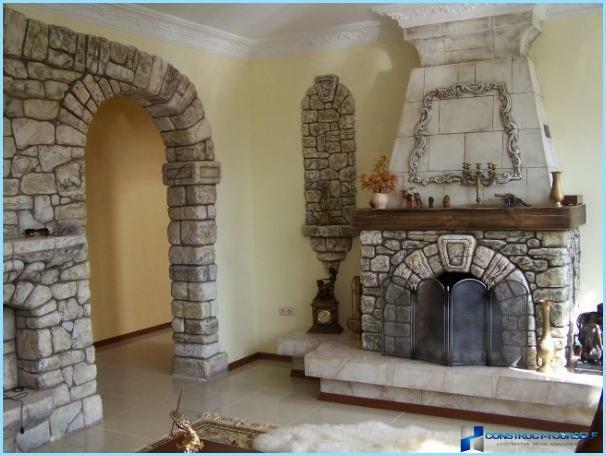 This arch can be decorated with all kinds of decorative elements: shelves, niches, spotlights. Drywall - an environmentally friendly, safe material. You can use it even in children's rooms. 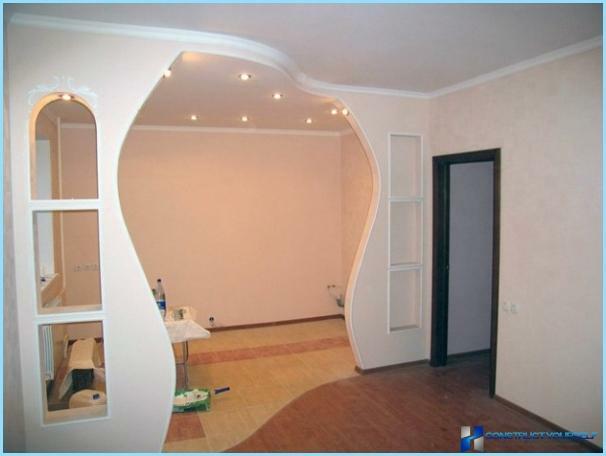 In comparison with other materials for the installation of arches, drywall most affordable. Attention! 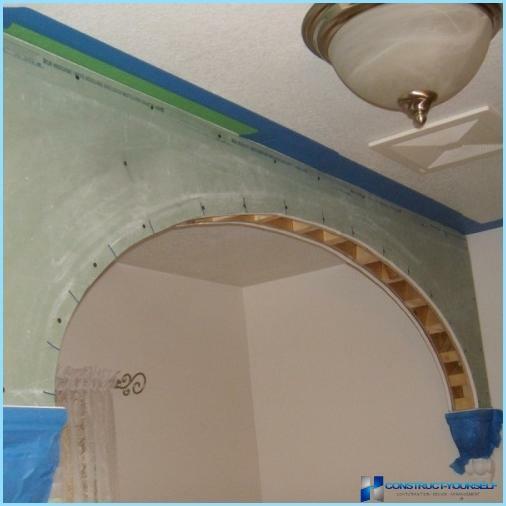 For the installation of the curved arch, you must buyspecial drywall. It is less thick, reinforcing the presence of special, high-quality fibers. 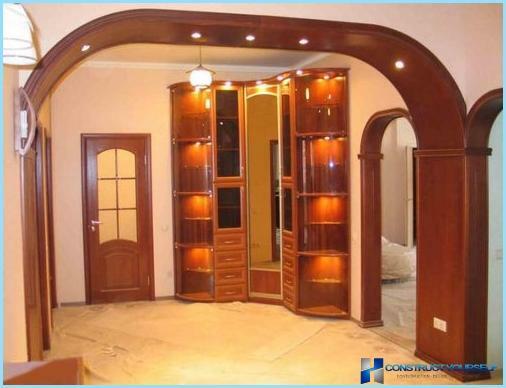 For ease of installation, it is recommended to buy ready-made kits arched skeletons. The lighting needs to be done at the stage of the frame assembly. Measurements - crucial stage. When installing, the arch reduces the height of the opening, so it is not necessary to mount the arch, if the door less than 2 meters in height. 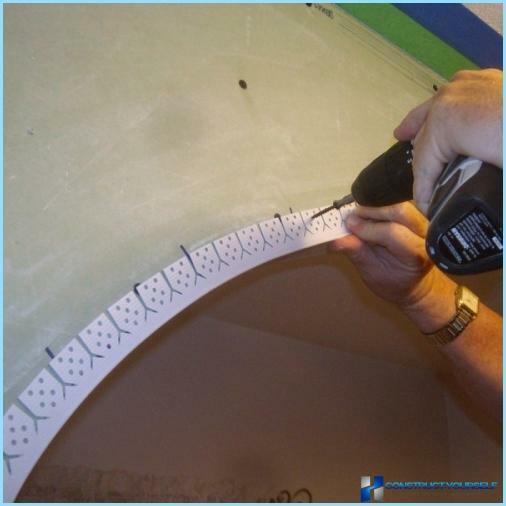 Preparation of materials for the installation of: profile, anchors, drywall screws, special perforated angle, coat, roller. Creating a "front" of the unit. Installation of frame of metal profiles. To fasten the frame parts produced. The elements which must bend when wetted with water and treated with a sponge roller. The final stage - priming, plaster. 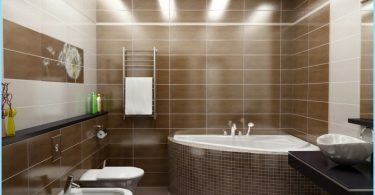 After that you need to carry out the final finishing with the help of wallpaper, paint. 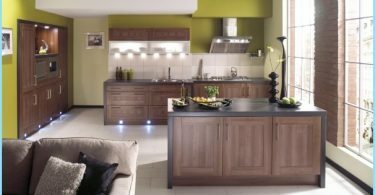 The choice of finishing materials depends on the style of the room. 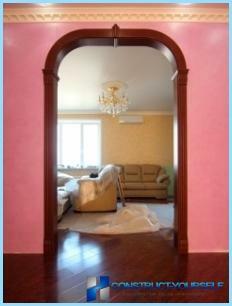 A popular design options doorwayIt is an imitation of the arch. This alternative design may be used in case of high doorway. By opening edges and the corners are attached structures pseudo-segments. 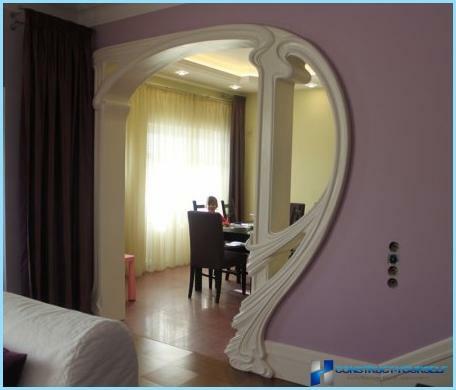 Imitation is suitable for rooms in oriental style. note! 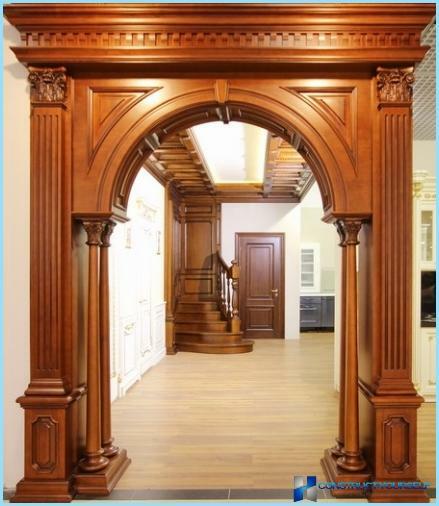 A common way to decorate the archopenings is moldings of polyurethane. 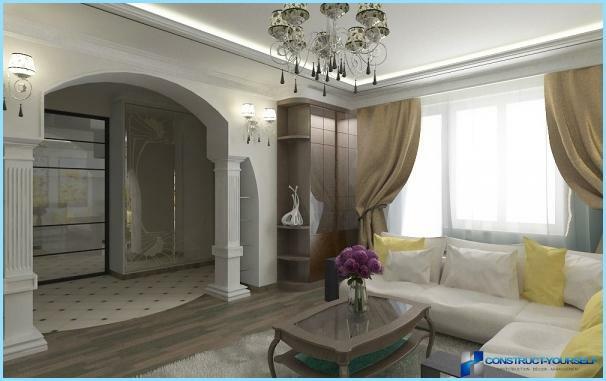 The interior in the style of classical, Baroque, Empire adorn these stylish decorative elements. Fretwork is attached with a special adhesive. 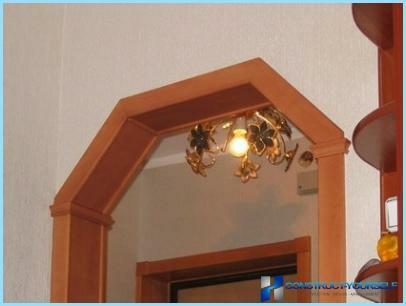 Polyurethane décor is designed as overhead bars - moldings, protruding parts - Sandrikov, artificial columns. The style in which the room holds.